Discover quality apartments where service matters. 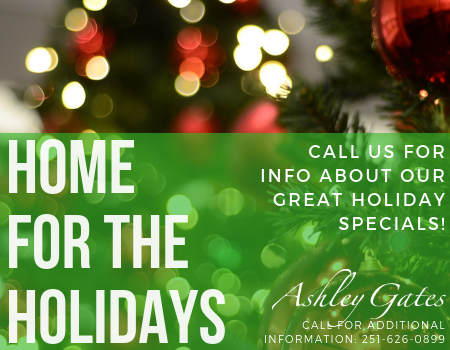 Ashley Gates Apartment Homes are located in Daphne, Alabama, only minutes from Mobile. This neighborhood is inspired by the enchanting beauty of Mobile Bay its Eastern Shore. Our apartments offer residents an uncommon opportunity of living in an upscale Mobile - Daphne community. Nestled in a neighborhood setting on Van Avenue, within walking distance from downtown Daphne and picturesque Mobile Bay, Ashley Gates Apartments sets the standard for those who desire the advantages of apartment living in the Mobile - Daphne area.